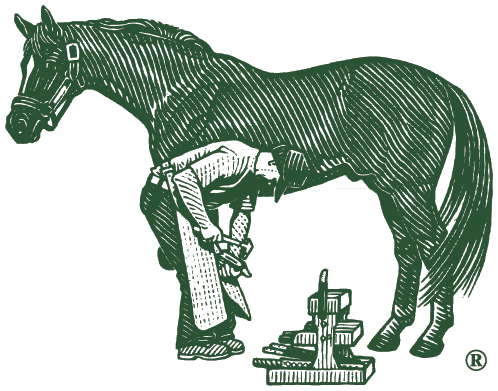 Farrier's Formula® is a pelleted hoof supplement that provides nutrients such as phospholipids, omega fatty acids, vitamins, minerals, and important amino acid “protein building blocks”. By the next trim 6 weeks later we could already see an improvement. 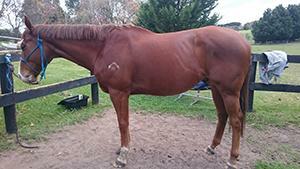 Farriers Formula® Double Strength has encouraged growth and I also think that it has helped his coat. Indi has always had a lovely shiny coat but I have recently noticed that his tail is getting thicker and shinier. I will keep supplementing his feed with Farriers Formula®Double Strength. It has really helped with the growth and overall health of his hooves, so much so that I am hoping to keep him barefoot once this whole process is over. You will see from the photo that we still have a while to go. Indi is almost back in full work although only in the arena and on grass. It is still too soon to take him on the road and into the forest. My horse Max is 24 years old now. I have owned him since he was four. I ride him mainly for leisure. From the very beginning he suffered with skin problems, in the sense that he developed recurring spots of crusty scabs on his body. My vet recommended contacting Ms. Zetsche of Life Data Labs who had a look at him and advised me about his feeding regime. Since March I am feeding Farrier's Formula Double Concentrate which improves hoof and skin quality from the inside while treating the scabby areas with Farrier's Finish to combat the fungal and bacterial infection. This has been very successful and Max´s skin and coat have improved significantly. He is much livelier and bolder now. Obviously he simply feels better than before. He does not look like an old horse at all!